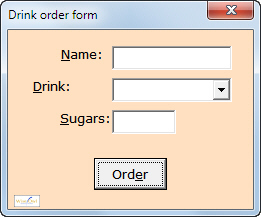 Learn how to create your own custom dialog boxes in VBA, using UserForms. 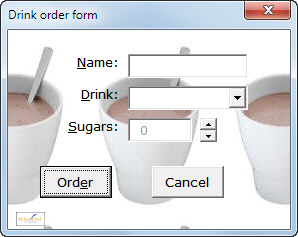 This is the first part of a three-part series (the other parts are on Writing Code for UserForms and Creating Advanced Controls). 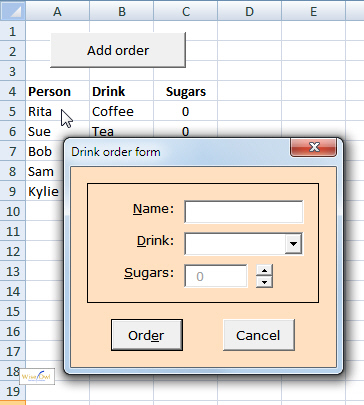 This blog is part of our Excel VBA tutorial series. We also run training classes in Excel and courses in VBA. 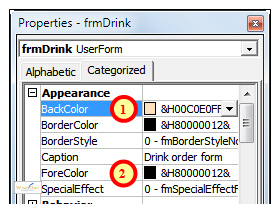 You can format a form or any of its controls by selecting it/them (as shown in the previous part of this blog), then changing properties as shown below. 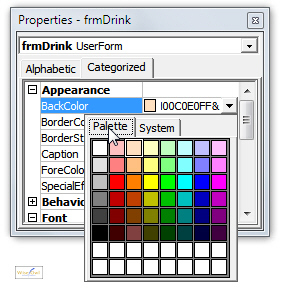 Choose the Palette tab to see what colours you are choosing! 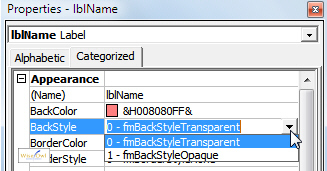 Change a control's BackStyle property to transparent to make it the same colour as the form it sits on. 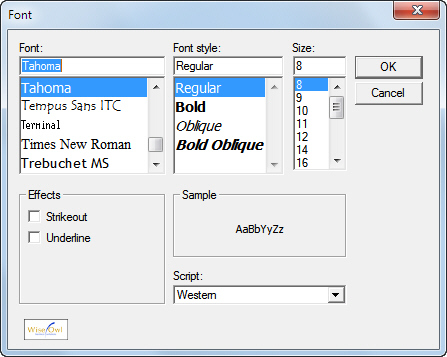 When you click in the Font property, a build button (with 3 dots on) appears. Click on this! Phew! Hopefully this now looks familiar. The default alignment is left-aligned, so someone has changed these controls. There should be tools like this. Where are they? 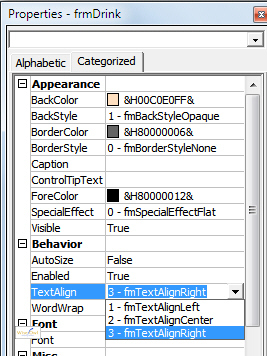 The TextAlign property has 3 less than obvious possible values. Vertically aligning text within a control is simple - you can't do it in user forms! If you want the title to appear in the centre of its box vertically, you'll have to press Enter before it. The Order button is horizontally centred on the form. 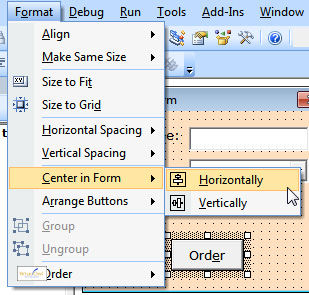 You can centre a control in the middle of a form going across or down. This control has a black border. 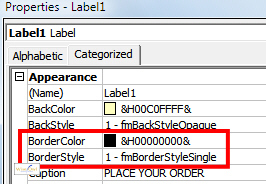 It's no use setting a border colour if you don't also set the border style too. There are some properties I reckon you shouldn't change! 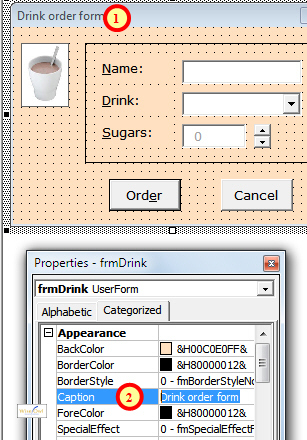 The Picture property allows you to set a background picture on a form, but they always obscure the contents. You can tile, stretch and zoom pictures, but the best thing to do with them is delete them! 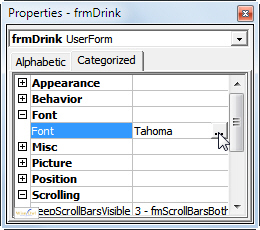 You can set the ScrollBars property of a form to Horizontal, Vertical or Both, but you'd be much better off designing your form properly (using MultiPage controls if necessary) so that you don't need them. 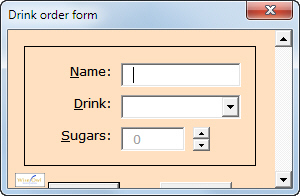 A form has a start-up position property, but the most sensible position seems to be in the middle of the parent application (Excel), which is the default, as shown here. 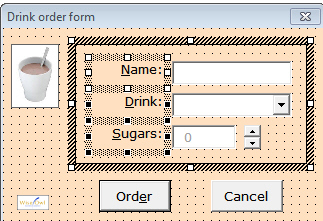 A form has a Modal property: if you set this to False, your users can ignore the form and click in Excel, which probably isn't a good idea. Now that we've looked at formatting a form and individual controls on it, let's move on to formatting multiple controls relative to each other: that is, aligning, sizing, spacing and grouping controls.